A data-driven investigation of the interaction between politics and finance in emerging markets, focusing on Latin America. Politics matter for financial markets and financial markets matter for politics, and nowhere is this relationship more apparent than in emerging markets. 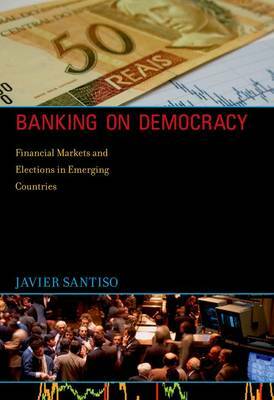 In Banking on Democracy, Javier Santiso investigates the links between politics and finance in countries that have recently experienced both economic and democratic transitions. He focuses on elections, investigating whether there is a "democratic premium"-whether financial markets and investors tend to react positively to elections in emerging markets. Santiso devotes special attention to Latin America, where over the last three decades many countries became democracies, with regular elections, just as they also became open economies dependent on foreign capital and dominated bond markets. Santiso's analysis draws on a unique set of primary databases (developed during his years at the OECD Development Centre) covering an entire decade: more than 5,000 bank and fund manager portfolio recommendations on emerging markets. Santiso examines the trajectory of Brazil, for example, through its presidential elections of 2002, 2006, and 2010 and finds a decoupling of financial and political cycles that occurred also in many other emerging economies. He charts this evolution through the behavior of brokers, analysts, fund managers, and bankers. Ironically, Santiso points out, while some emerging markets have decoupled politics and finance, in the wake of the 2008-2012 financial crisis many developed economies (Europe and the United States) have experienced a recoupling between finance and politics.